I feel like this is the first time I have ever gotten myself organized and planning for Christmas this early! Usually, I figure the beginning of December is early enough, but then before I know it, I'm racing around trying to get gifts for those people I just can't find something for. But this year, I have finally learned how to do it right, and it starts with a trip to Chapters! I've actually notice I always end up at Chapters any time I'm searching for a gift for someone. I'm not the biggest book worm (ok, not really at all), but I could spend hours scouring all the fashion, décor, kitchen goods, and stationary...and I always seem to find the perfect little gift for whoever I'm looking for. So I'm planning on it being one-stop-shop for Christmas gifts this year. 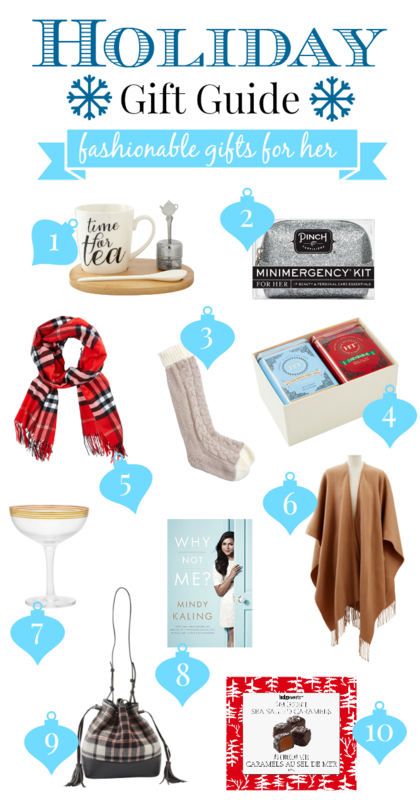 This is my first gift guide of the season, specifically for the fashionable woman in your life (or even just something for yourself). Stay tuned, and I'll have a men's and kid's gift guides coming soon too!